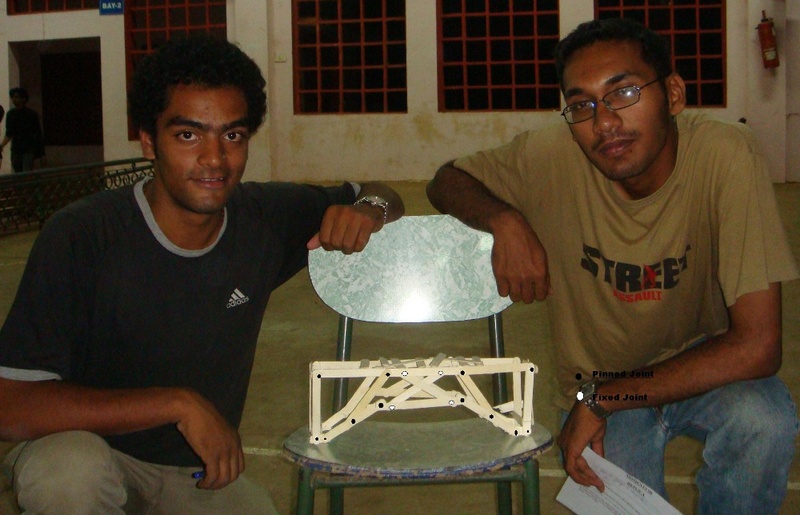 At our college earlier this year, we had to build a bridge using popsicle sticks within one hour. We were provided with about 60 sticks, a cushion of office pins and a tube of super-glue. I have attached a picture of the bridge we constructed, that eventually won the first place. I’m sorry I don’t have a better picture to show you. I have pointed out the fixed and pinned joints, at least that’s where I remember them to be. It was extremely difficult and painful to drive the pins in, especially when no other tool was allowed, and I had to use my finger for the purpose, but it was very rewarding. You should try it out sometime. P.S. I’m the guy in the black tshirt. Nice bridge, I like it. 48 queries in 0.551 seconds.